A CORNISH BUS company has scooped two of the most prestigious awards in the business. When you get a headline like that you can have a good guess at who they are talking about. Yes - its Western Greyhound again! Summercourt-based Western Greyhound won the titles of Independent Operator of The Year at the UK Bus Awards as well as Medium Operator of the Year at the RouteOne Operator Excellence Awards. Mark Howarth paid tribute to the team effort across the operation, stating: "I am delighted that the hard work of all Western Greyhound staff had been given such extensive recognition by the industry. A DAMNING report by the Audit Commission (AC) has downgraded Cornwall Fire and Rescue Authority's performance from a "fair" rating to "poor". I think the jury is still out on this one! Although, if I had hired a coach and ended up sitting on the back seats above the rear wheels I wouldn't be to thrilled about the view. 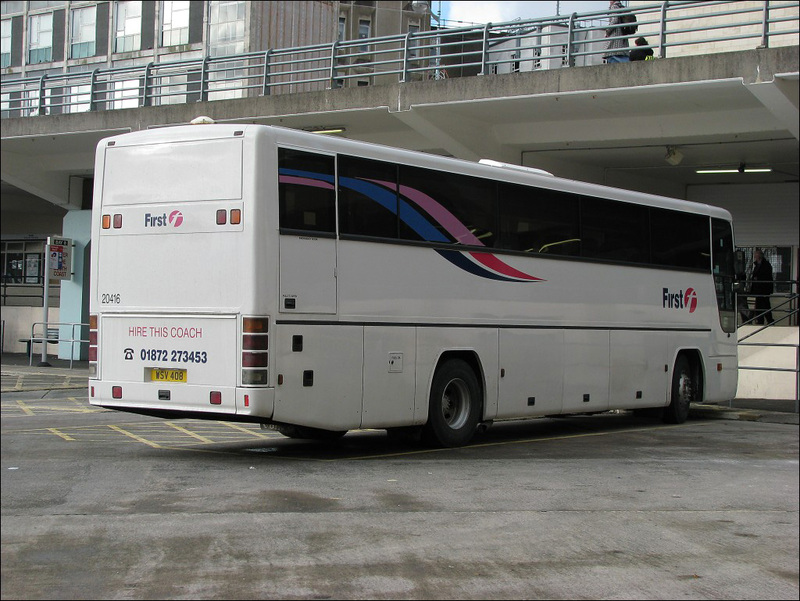 Yup, First Essex received 5 high spec Volvo/Plaxtons for the X30 Stansted Airport - Chelmsford - Southend service, which are in this livery, albeit with "aircoach" branding applied also. Sister Cheetahs and B12M/Plaxton [the B12Ms ex-FEC] have been similarly outshoppped for X22 Stansted Airport - Colchester - University of Essex. At FEC, new DP-spec B9/Wright 'deckers are also in this scheme, with branding for X1 Gt Yarmouth - Norwich - Kings Lynn - Peterborough.